Find a vacation home to rent in Liege from our list of vacation rental properties. Campaya has over 539 vacation homes available in Liege, which give you the possibility to locate a unique accommodation in Liege which completes your check-list in search for the perfect self catering vacation apartments in Liege or vacation villas in Liege. 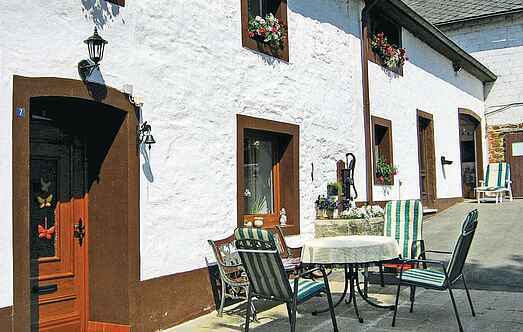 These comfortable apartments are located in Steffeshausen, a beautiful village in the town of Burg-Reuland. They are ideal for enjoying a holiday with family and friends. This well-maintained apartment is located on the first floor of a typical building in the Ardennes region. This comfortable and well-equipped holiday apartment on the ground floor is situated 5 km from the lake of Butgenbach. The house Les Rosiers is located in a privileged place in the Hautes Fagnes in the Belgian Ardennes. This large, independent villa is located in the small village of Honsfeld, near Büllingen. This holiday apartment with a balcony and two additional beds is situated on the first floor in a block of apartments, 5 km from the lake of Butgenbach. This beautifully renovated house is located in Heppenbach, in the municipality of Amel. Here, you can enjoy a pleasant holiday with your family and friends. This well-kept apartment is spread over two floors. It is located in a quiet area and is only 5 minutes away from the centre. The hall is shared with the owner. This romantic villa is located just outside the resort town of Spa, around 1 km away from the famous thermal baths. This former hotel has 11 bedrooms and 8 bathrooms. This spacious apartment with a private entrance is located on the ground floor of a house in the village of Weywertz. One dog is allowed on request. This nice apartment is located on the first and second floor of a house in the village of Wirtzfeld. It has a well-equipped kitchen and a separate lounge. Historical, rustic house in a style which is typical for Eiffel. Quiet surroundings. New bathroom and kitchen. Low floor-to-ceiling height and doors. This rustic and elegantly furnished holiday home is located in a quiet area, just outside the village of Villettes.